DISCOUNTS FOR SENIORS, VETS & DISABLED. NO EXTRA CHARGE ON WEEKENDS! Providing HVAC and air conditioning services and repairs in South Florida for over 20 years. 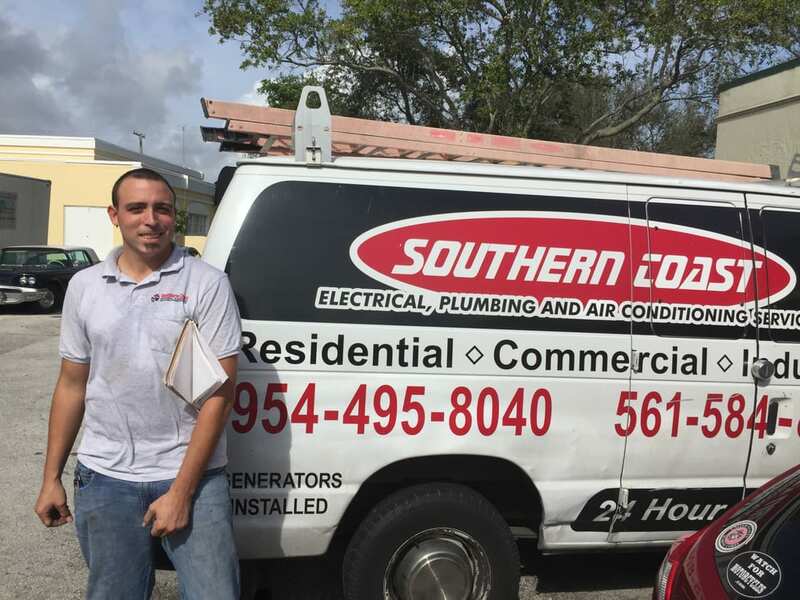 Providing South Florida with exceptional air conditioning services for over 20+ years. We understand the toll southern Florida’s weather can have on our A/C units. We have comprised a team of quality professionals to assist you in any way possible. No matter the problem our skilled technicians and top of the line equipment will keep your A/C unit running in tip-top shape! When its time for a new unit know that Southern Coast Air Conditioning will make sure your new unit is installed properly. Not sure where to start or what’s your best option? Our technicians are standing by to provide excellent customer service. Please call us or schedule your HVAC service or repairs using our contact form. For Emergency Service, please call us at 954-495-8040. So happy with the service my family received from Southern Coast! They showed up promptly, diagnosed the problem quickly, and were extremely affordable! I would definitely recommend these guys to anyone needing electrical help!" I recommend the guys from Southern Coast for all of your electrical & contracting needs. Quality work and reliable. Helped my grandparents immediately. This was a great investment on an ac unit, it works perfectly and has not let me down in the past 2 years. I was referred by a friend to Southern Coast. He had their kitchen and bathrooms were done it was extremely ecstatic and satisfied with the work that they completed. I decided to call them up and give them a shot. They sent don't like which was very knowledgeable and new every aspect of the job. He went through everything that we need it done in our kitchen from the construction, electrical, plumbing, HVAC and All the notes and crannies with the cabinets. They gave me a timeline of four weeks to fabricate and install the kitchen. They did for behind a week and a half but only because of the hurricane that hit South Florida. They did call us and informed that they would be late I'm delivering the kitchen and we were OK with that. Once the kitchen was delivered and installed we were completely satisfied. We even had a punch out list after a week just seeing some minor things that needed to be touched up so we called them up and let them know of all the items. They sent David there right away to complete the punch out list. Overall this company should be rated 10 stars not just five thank you Mike and Southern Coast. SENIORS, VETERANS AND DISABLED – DISCOUNTS AVAILABLE!